iPhone uses iTunes to sync to your computer. Syncing allows your device and your computer to share information and enables your computer to store a backup of the data on your phone. After you sync your phone for the first time and set your preferences in iTunes, connecting your device to the computer will automatically sync to your phone with the click on one simple button. You are able to sync contacts, applications, calendar entries, music, notes, web bookmarks, photos, movies and tv shows, podcasts, ringtones and iTunes U content. Before you can sync iPhone to computer you’ll need to make sure you have the current version of iTunes downloaded to your computer. Download iTunes for free from Apple’s website. You will also need iPhone’s USB cable to connect your device to the computer. 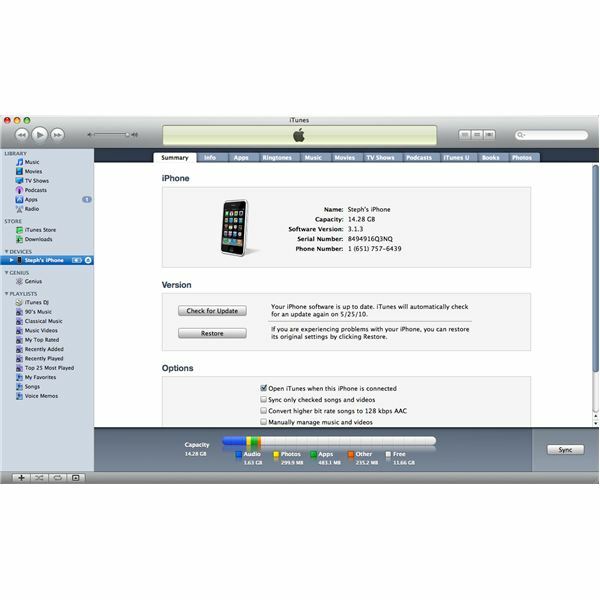 Once you have the current version of iTunes downloaded and your USB cable, you are ready to sync your iPhone to your computer. Syncing an iPhone to a computer is simple after you have set your preferences in iTunes. The first time you sync iPhone to computer, make sure to go through each set of options to set your preferences (step 3 below). The options you select will be saved and used the next time you sync your iPhone (unless you go make changes prior to syncing). 1) Open iTunes if it doesn’t open automatically. 3) You will find that the ‘Summary’ tab is selected. Scroll through each tab across the top of the screen and select which items you would like synced. Make sure you click ‘Apply’ in each tab that you make changes to. 4) When all desired options are selected, click ‘Sync’ in the bottom right hand corner. Do not disconnect your phone after selecting the ‘Sync’ button until you are instructed to do so. 5) The status bar at the top center of the screen will say "Syncing iPhone" (instead of ‘iPhone’ it will list the name you selected for your device). Syncing may take up a few seconds to several minutes depending upon the amount of new data to by synced. 6) When the sync is complete the status bar at the top center of the screen will say "iPhone sync is complete. OK to disconnect." You may now disconnect your device, your iPhone sync is complete.